As with every tour this one began at the customary starting point, Kyle’s house in the centre of Bewdley. It was the usual straightforward motorway run down to Dover; M40, M25 and M20/A20, enlivened only by the need to filter through the heavy traffic on the mobile car park that is the M25 London Orbital Motorway. Arriving in Dover for our cross channel ferry we had to endure the now customary long queues in 30°C heat. Eventually we passed through passport control and after a brief customs check to see if we were carrying any explosives, or had fired a gun recently, we were waved through and headed off to the DFDS Seaways check-in. Not long after we were on the ferry and making our way over to France. Disembarkation the other side was simple and within minutes we were leaving Calais and on the A16 motorway heading for Dunkirk. 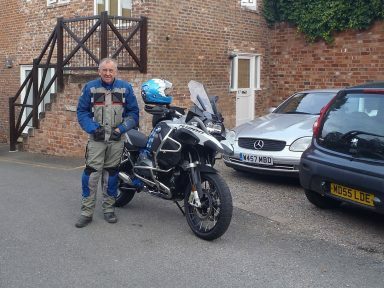 The only point of note on this leg was the two very large groups of British bikers all riding like numpties and getting in each others way, not to mention ours. 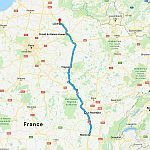 We made short work of them and at Dunkirk we picked up the A25 motorway to Lille and then the A23 to Valenciennes – in all a little over 320 miles. 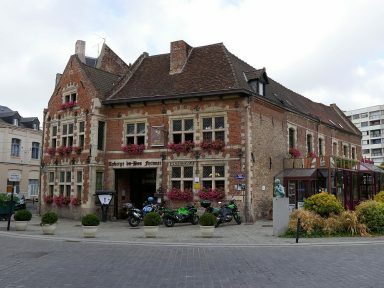 For our first night we were booked in to the very pleasant Auberge du Bon Fermier. There was secure bike parking a short walk away – something we always look for if possible, and after checking in we agreed a 30 minute turnaround to meet up in the hotel bar for a drink. After a fair amount of strong local beer, and a very nice meal in the hotel restaurant, we were done for the day. The following morning we were up and about early. 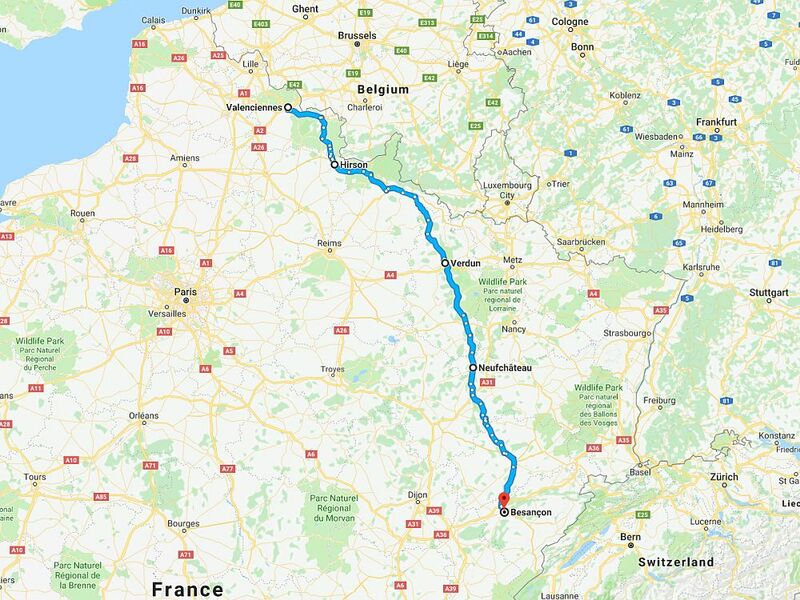 First order of the day was breakfast and a quick chat about the route we were taking to Besancon. 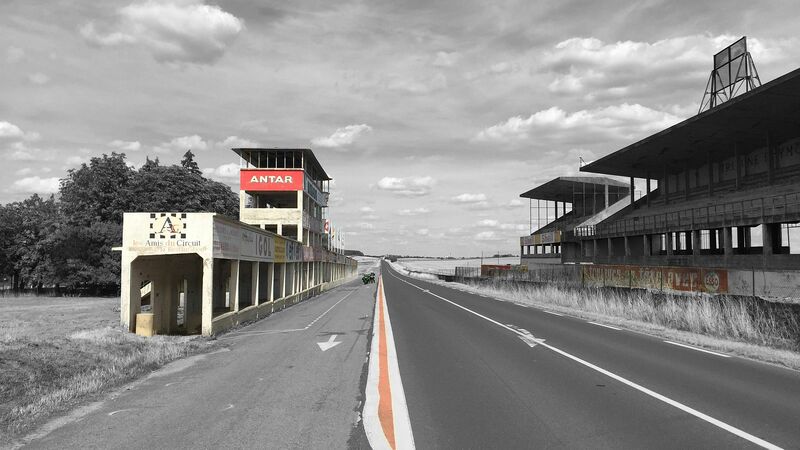 From this point onward the plan was to stay off motorways and stick to N and D roads – Nationale and Departmental roads. 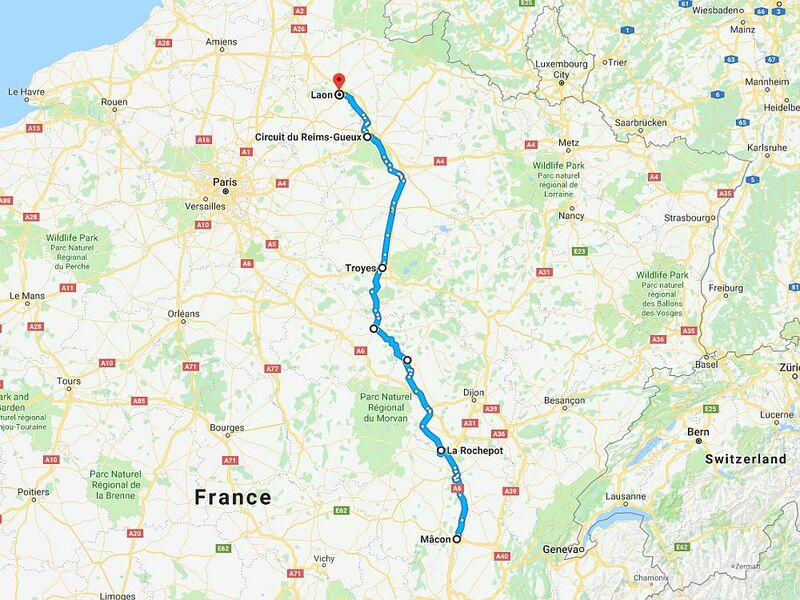 In fact the roads we finally agreed upon could have been pretty much anywhere, particularly the aread around Verdun and Neufchateau. 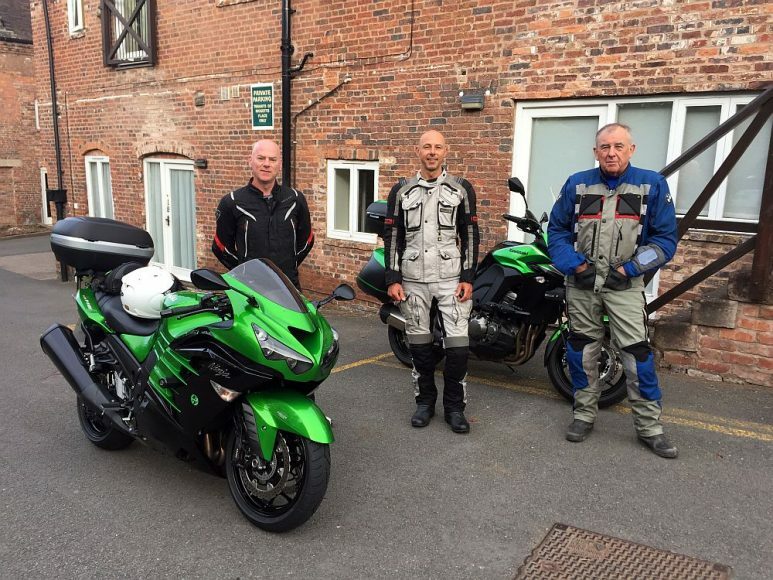 Having said that they were good riding roads, and with it being Sunday they were also very quiet. The real riding would start in earnest tomorrow though. 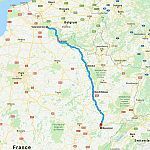 By early evening, and after another 320 miles covered, we arrived in Besancon, a city quite familiar to us by now. We were booked in to Hotel Victor Hugo, another hotel with secure parking and one we’ve used a couple of times before. A nice hotel, reasonably priced, about a 10 minute walk away from the city centre. Besancon is a nice city located on the Doubs River, close to the Jura mountains and the border with Switzerland. 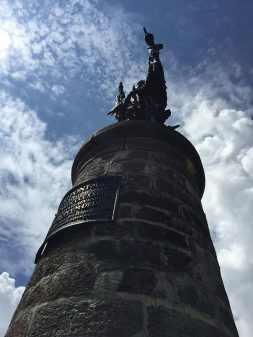 The fortifications of the city are listed as a UNESCO World Heritage Site and it’s been labeled a Town of Art and History. Since we first started coming here there have always been extensive works going on but it looks like the new tram network they’ve been building is now complete. 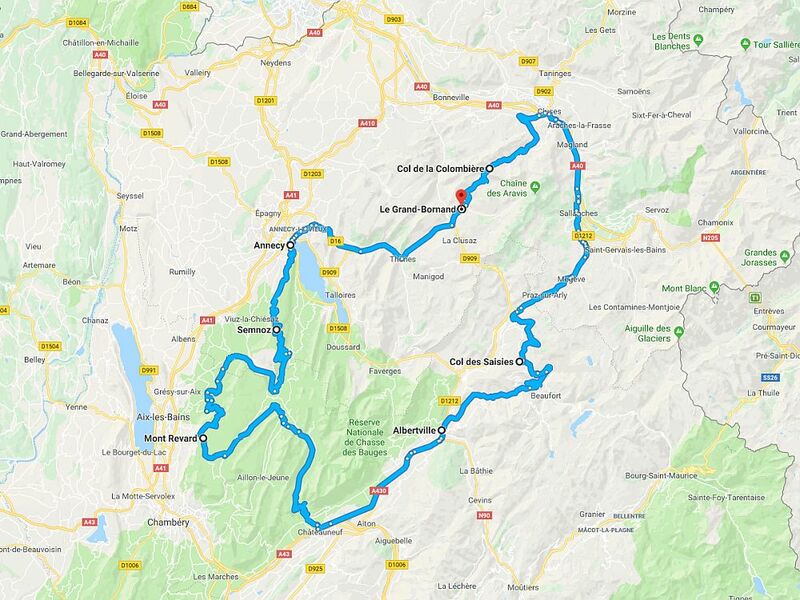 Monday dawned and Le Grand-Bornand was only 120 miles away by the most direct route. We hadn’t come all this way to just travel though, we’d come to ride. So our preferred route was just shy of 290 miles and would take all day. 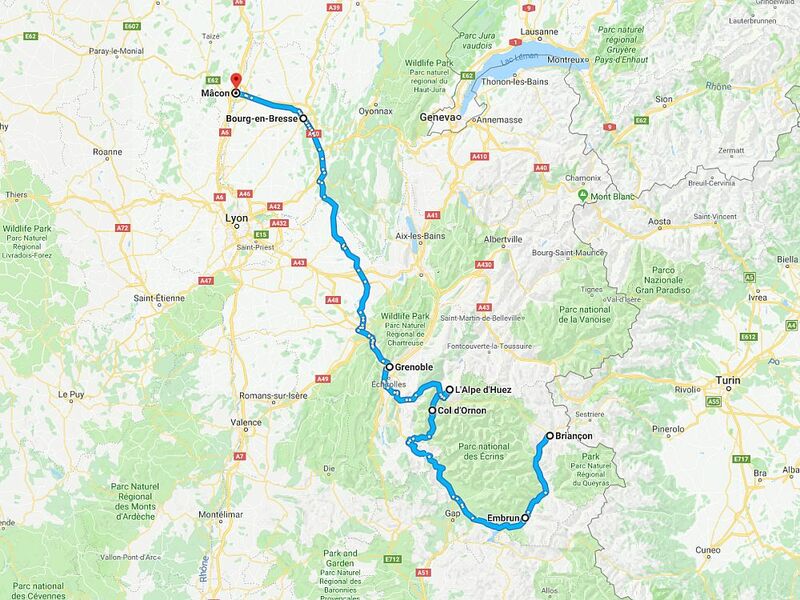 But we had to get to Martigny first before the fun could start. 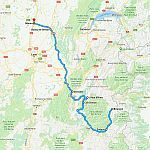 Leaving Besancon we spent the first 50 miles of the day riding down the N57 across the Jura, a nice but increasingly busy stretch of road that took us past Pontarlier and over the Col de Jougne to Vallorbe where we crossed into Switzerland. 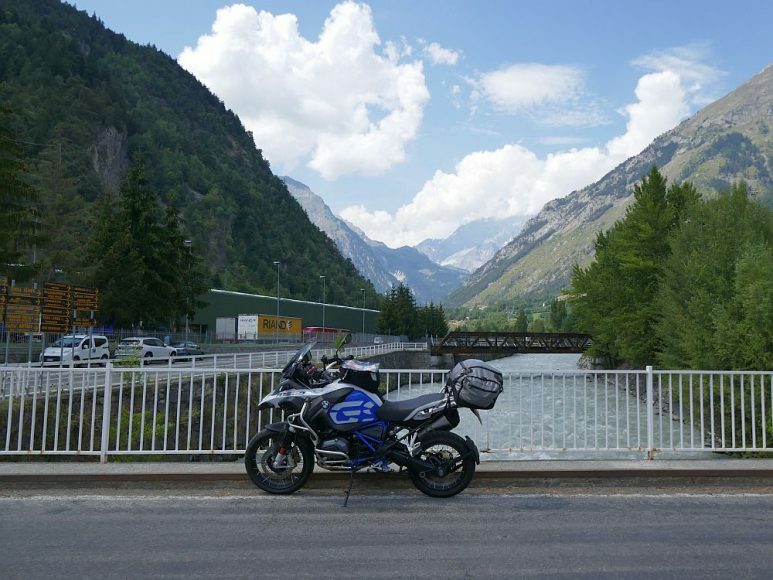 From the border it was another means-to-an-end motorway run straight down the A9 into Martigny – about 120 fast miles leaving 168 slow miles ahead of us. 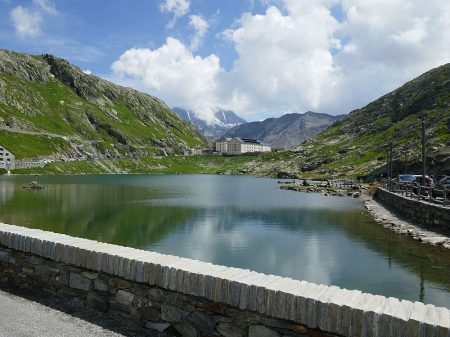 The bulk of our route today was going to take us over 6 mountain passes – 7 if you count the Meraillet, and began with a particular favourite of ours, Col du Grand St. Bernard. 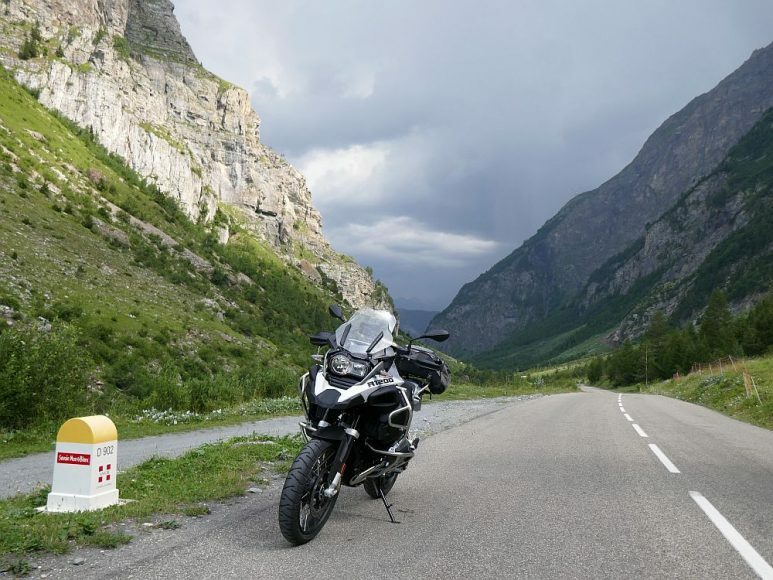 This pass is very well signposted from Martigny and from here the road surface is excellent. 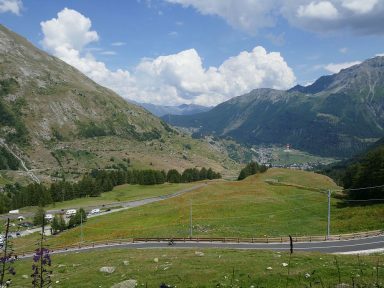 It’s wide and open all the way up to Orsieres, in fact Bourg-Saint-Pierre too where it reaches the tunnel. The tunnel is open throughout the year but you don’t want to take it – be sure to branch right onto the slip road that leads to the actual pass road. 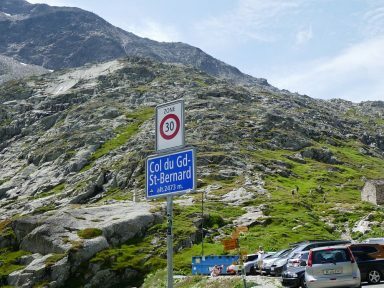 The Grand St. Bernard is a must ride pass and we never tire of riding it. Heading up on the Swiss side the road just gets narrower, tighter and steeper the higher you climb. 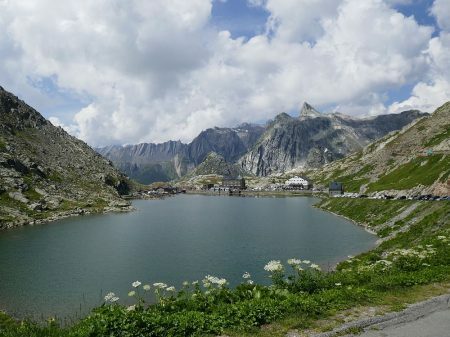 Finally you reach the hostel at the top before rolling down the other side past the lake and you’re into Italy. 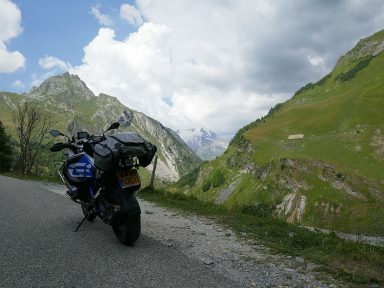 The ride down the Italian side was a really nice 25 mile run all the way to Aosta. 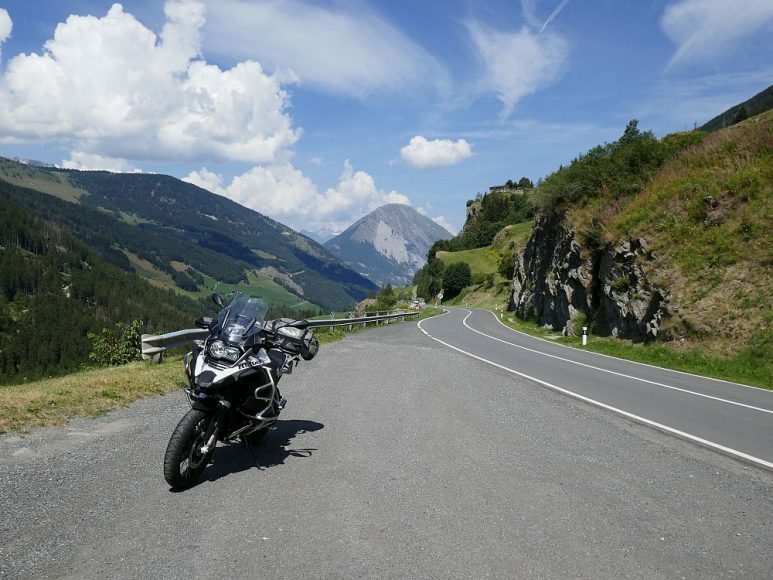 The road surface on this side of the pass is much better and the views are stunning so we didn’t rush. 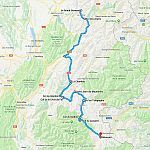 After making our way through the town we joined the SS26 and headed down the Aosta Valley to Morgex. 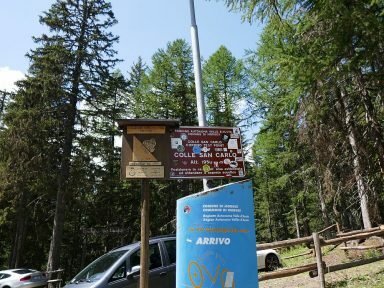 Approaching Morgex we picked up signs for Arpy and from there the Colle San Carlo was well signposted. 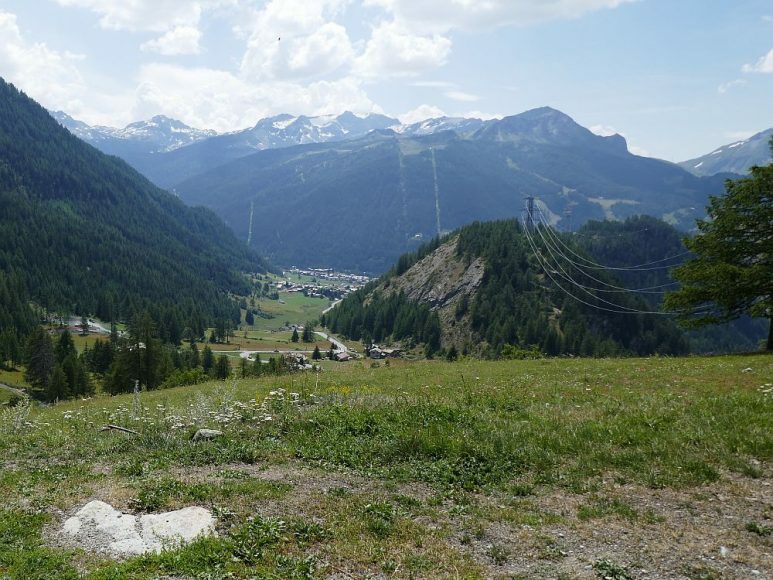 The San Carlo is pretty in its own way, the road surface is fairly poor and it’s steep, but the entire 6 mile run up from Arpy is tree-lined which means there aren’t really any views to speak of. 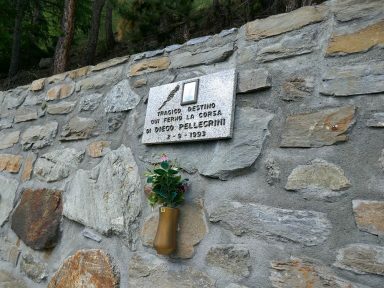 About half way up there’s a memorial to Diego Pellegrini, an Italian cyclist who died while descending it in 1993. 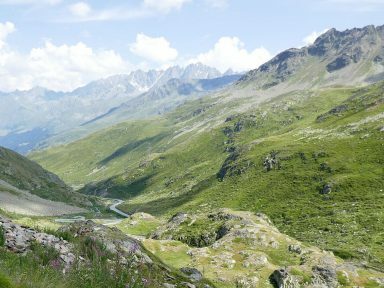 After cresting the San Carlo we dropped down into La Thuile which sits at the base of the Col du Petit St. Bernard. 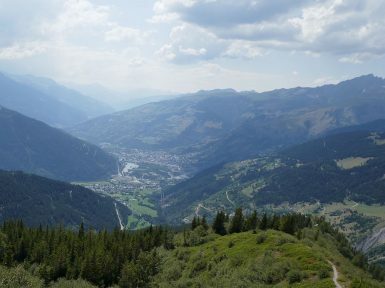 This busy little town marks the start of the climb and from here, with a few exceptions, the road up is well surfaced. It’s also fairly wide which means the hairpins aren’t too tight. This is mainly due to there being a ski station at the top. Near the top we passed Lago Verney that told us we were almost there, and when we did reach the summit the road flattened out for the next few miles. 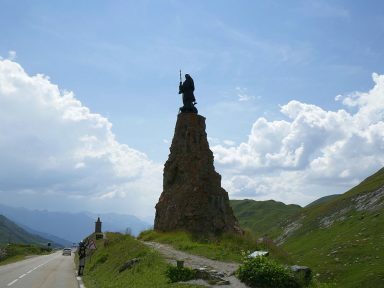 It was here that we left Italy and entered France, and passing various cafes and restaurants we finally reached the monument to St. Bernard of Menthon that marks the end of the plateau. Before starting our descent we stopped to take some photos of Saint Bernard, stopping again a few miles later just after the ski station at La Rosiere. 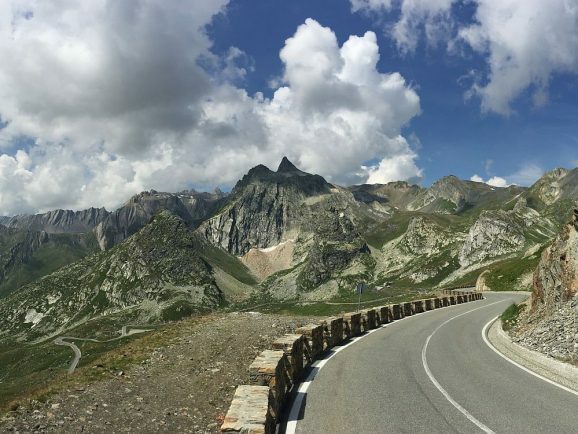 The last time we stopped here the entire mountain was shrouded in mist but today we were fortunate and had a great view looking down at the base of Tarentaise Valley – and the 19 hairpins that lay between us and Bourg-Saint-Maurice. At Bourg-Saint-Maurice the traffic was particularly heavy and the inevitable happened when Phil became separated from Kyle and Taj. 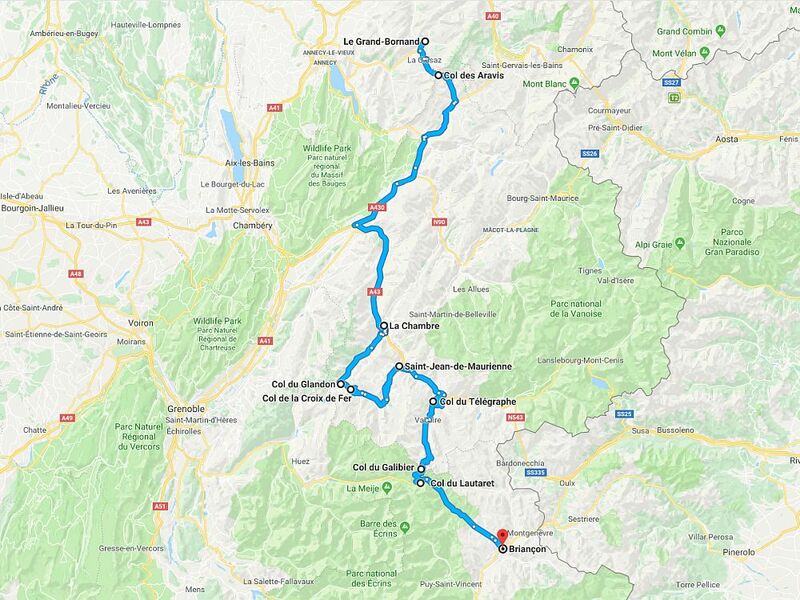 Kyle’s understanding was we were running later than anticipated and to cut down the journey time to the hotel we were giving the Cormet de Roselend a miss today. Possibly riding it another day. Phil’s understanding was we were riding it. 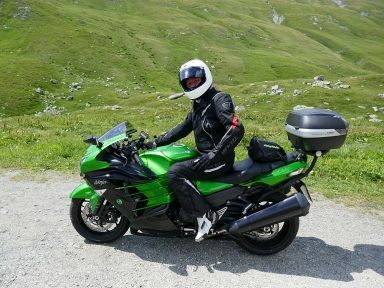 So while Kyle and Taj took the fastest most direct route to the hotel, expecting Phil to catch up, Phil headed for the Cormet, expecting them to be somewhere in front of him. 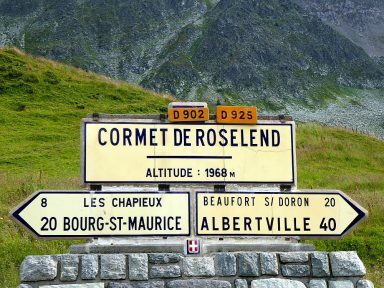 The Cormet de Roselend, along with the Col de Meraillet, connects Bourg-Saint-Maurice with Beaufort. 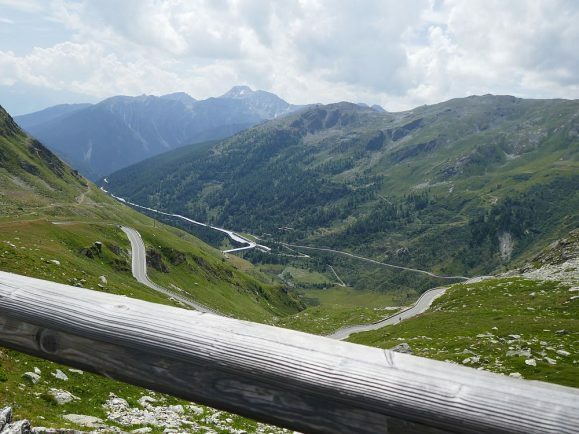 The first part is single track, although there are passing places, and early on there is a series of 10 tight hairpins. 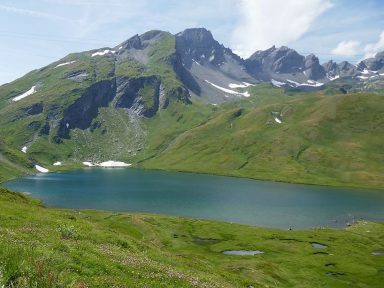 Once negotiated you then enter a high Alpine valley which truly is beautiful. We all agree the Cormet is one of the prettiest passes in the Alps and for Phil today there came a point where if it wasn’t for the clouds, he would have been able to see the summit of Mont Blanc. 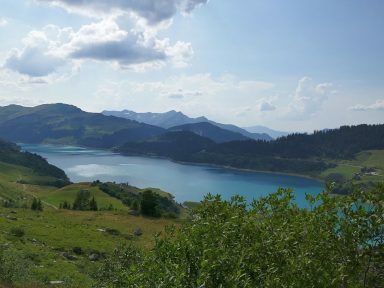 From the top it’s a fairly fast descent into Beaufort and before you know it you’re straight onto the Col des Saisies. Quite frankly the Saisies isn’t much to write home about but cyclists may remember it as the backdrop to the infamous Floyd Landis solo attack on stage 17 of the 2006 Tour de France. 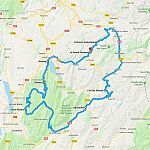 The previous day he’d haemorrhaged time and dropped to 11th place overall yet miraculously managed to put himself back in contention the following day by winning the stage with an epic 120 km – 75 mile – breakaway, taking back almost 6 minutes. 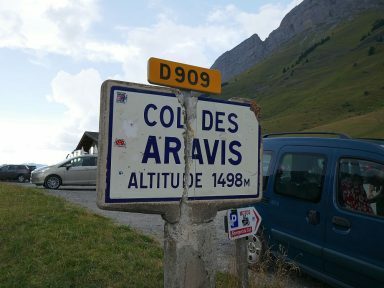 After dropping down from the Saisies it was on to Flumet and then up the final pass of the day, the Col des Aravis. This was okay but in reality it was more of a box ticking exercise. 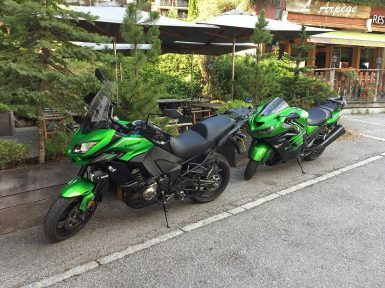 By the time Phil finally arrived in Le Grand-Bornand and spotted Kyle’s Versys and Taj’s ZZR parked up it was approaching 7pm and they’d already unloaded their luggage and made themselves comfortable at Chalet Les Saytels – our home for the next couple of nights. It’s a nice enough hotel, centrally located and reasonably priced, but no secure parking, although the bikes were all safe enough parked out front. For our first night in Le Grand-Bornand there was certainly lots going on with live music in the centre of town and plenty of street food available. The town also has more than enough bars and restaurants to choose from and it didn’t take us long to find one of each that suited our needs. A really pleasant end to a very good day.